What better way to start the National Day of Writing than by writing a blog post while traveling on a train to a Teachers College Reading and Writing Project 95th Saturday Reunion in NYC? In a few hours, the writer Kate DiCamillo will give the morning keynote address titled “Home Again- Finding Our Way Through Stories.” I have written about Kate before, and I have admired her ability to combine unusual elements in a story, for example, a squirrel, a vacuum, and poetry in her Newbery winning children’s book Flora and Ulysses. Reading through a story means moving into one side of the story -its setting, conflict, and character’s point-of-view, and going out the other see of the story arc and resolution of conflict. Reading “through” a story is enjoyable. 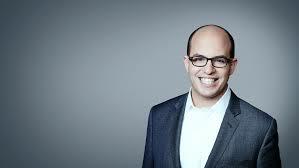 Getting “through” a story is not as pleasurable. Yet, I often hear the phrase, “have to get through” as if through means having to endure or having to struggle or trudge. I have been guilty in the past of stating how I have to get “through” a literature unit, feeling like I am dragging students “through” a novel, a test of their endurance and of mine. Now, when I hear teachers expressing a desire to get “through” a unit, I cringe. I am certain no author intended that experience for the reader. What an author wants is what is expressed by readers who are engaging in The Great American Read. I have been following The Great American Read, an 18-part-series on PBS that features 100 of the best-loved novels read in America as rated in a national survey (see checklist). This is a book popularity contest, and anyone can vote daily on their choice of book. The television episodes feature interviews with readers including some celebrities or literary critics. What I am struck by, is the number of people who begin to discuss a favorite book by saying, “I must have read this book…” and then proceed to give a number: a dozen times, 25 times, even 100 times. These readers are not trying to “get through” a novel;. They are wallowing, lingering, and finding something new in their rereads. Their “through” experience is one worth repeating. Of course, this means that those teachers who discourage students from rereading a book should take note and reconsider. In The Great American Read, the practice of rereading a favorite novel is celebrated. The Great American Read concludes this coming week (10/23/18) when the number one book will be announced. Selecting a “winner” by popular acclaim will certainly disappoint some viewers who will have, as Kate’s speech promises, found their way through a story. Which means (as I approach NYC) that I have also triangulated on this National Day of Writing: the preposition “through,” The Great American Read, and Kate DiCamillo. That is the answer to the question in the hashtag #whyIwrite ? I write to make connections. Happy National Day of Writing, 2018! Murray’s point was that in the professional writer’s world, or the real world, writers have time… or they find time… in order to make time for revision. Complicating the need for dedicated time is the demand for student writing to grade in order to meet assessment schedules: progress reports, quarters, mid-terms, trimesters, etc. That need to grade everything a student writes-drafts, rewrites, final product- is the least authentic part of the writing process. Just check with Mark Edmundson in his book Why Write? 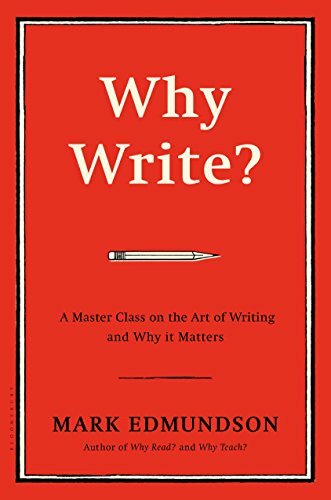 In the 30 chapters Edmundson uses to answer his question Why Write? the one reason missing is To Get a Grade. In other words, the major reason that students write in school is the one reason missing from the long list of reasons a writer gives for writing. Murray also noted that students see revision “as an indication that they have failed to do it right the first time,” and to be honest, many teachers have not worked to disavow their students of this belief. So how to improve teacher and student attitudes towards revision? When to find the time? Why not start on National Writing Day? 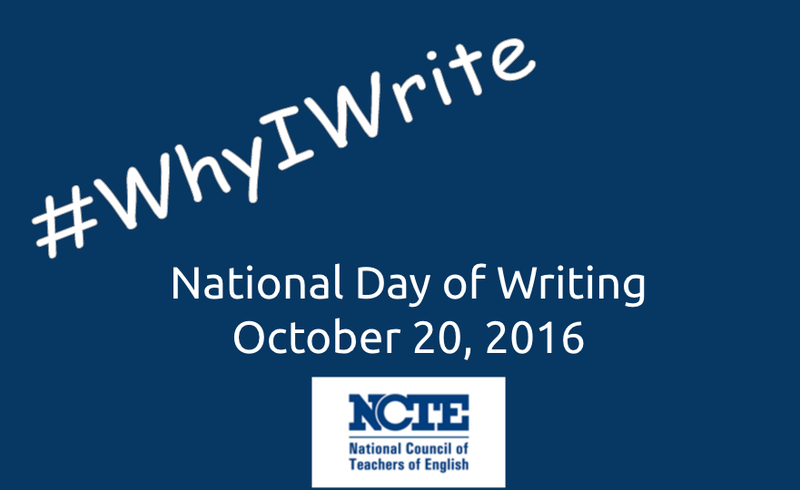 National Writing Day is based on George Orwell’s essay, “Why I Write” and is celebrated annually in October. Orwell understood the difficulty in writing (“Writing a book is a horrible, exhausting struggle”) to edit out the “purple prose” or those “sentences without meaning.” Orwell saw revision as necessary for good writing. So, on this National Writing Day, (10/20/17) you may decide that students do not need to start something new in response to the suggested “Why I Write.” But if they do, they could practice revising their reason(s) why they write. Charlotte’s Web draft #2 by E.B .White from The Annotated Charlotte’s Web, 1994. Use the audio and images” in “An Explanation of The Westing Game Manuscript Materials” that show the revisions made by YA author Ellen Raskin for The Westing Game. Share the well-circulated image of JKRowling’s revision process for Harry Potter’s Order of the Phoenix. Share Kate DiCamillo’s drafts of the first chapter of Because of Winn-Dixie that also has her entertaining comments on each of the five revisions. Include science teachers and share drafts from the prolific science writer (astronomer, astrophysicist) Carl Sagan from the website of the Library of Congress Manuscript Divison. There are twenty full drafts of his works in the archive including 355 pages of the first draft of his novel Contact, with revisions, in entirety. Contrast E.B.White’s opening line “Where’s Papa going with that ax?” in Chapter 1 of Charlotte’s Web with his draft #2…and see which students prefer. Model your own revisions in your writing! It’s not because writing is fun…writing is hard. It’s not because I have the time to write…. (so far the first two sentences in this response have taken over two days to construct so they sound the way I would like them to sound). It’s not because I like the end product…(I still think the aforementioned two sentences need more work). In fact, I usually think of a better ending several hours after publishing. It’s not because I take unnecessary risks. I am self-conscious; I self-censor. I do not want to be misinterpreted. Writing on a blog that is public is a bit like performing linguistic acrobatics without a net. I write because I cannot provide support in reading and writing for teachers and students if I do not read and write myself. So, I write publicly as a performance task….as an “authentic task”, one that I might assign to students. I write because I want to remember my own ideas (I am getting forgetful). I write because the act of completing a sentence, a paragraph, or a blog post in this distracting world demands focus, even if that focus is for a brief amount of time. Nevertheless, the spider Charlotte does weave the word terrific into her web. She writes and because she writes, Wilbur is spared. What better reason to write then the one that E.B. White offers? Writing saves lives.